This week I transcribe a letter my grandfather, Martin Deutsch, received during the war from his brother, Ted. My grandfather was stationed in Africa. Ted worked for a Chicago newspaper, and used what was handy on which to type his letter. On Tuesday, March 22, 2011 I asked the woman of my dreams to marry me. 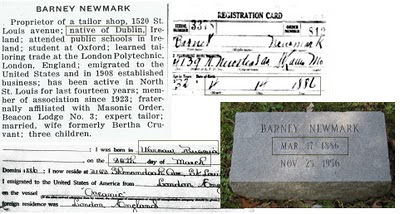 A date has not been set, but there is a distinct possibility that this blog may in the future discuss several new surnames, as well as Scottish, Irish, Norwegian, and/or German genealogy research in greater depth than it has. I know that his sister Cissie (or Cecile) celebrated her birthday on July 4th. However her British birth certificate is easy to obtain, and she was really born on August 16th. The Newmark family settled in an Irish area of St. Louis on their arrival in America, and I wonder if some of the children adopted local celebrations near their birthday as their own. In a way, I owe my obsession with genealogy to my great grandfather's fib. It made for a fun story to tell my friends on the holiday, and one of those friends was also obsessed with genealogy, so he conducted a search, and sent me a link to the 1920 HeritageQuest census for my great grandfather. Once I realized what was available online, there was no turning back. I know it isn't April yet, but every year I start to think about what I will do to celebrate National Poetry Month a few weeks early. I've been writing poetry for over 25 years, since I was a teen, and I have been performing poetry at area open mics for over 15 years. 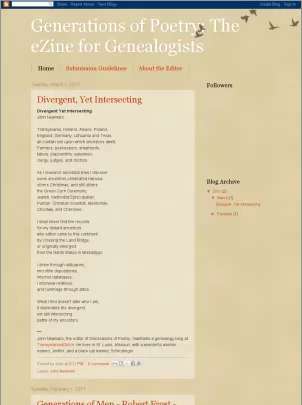 In 2009 I attempted to write and post a poem-a-day of my own poetry, and only managed 20. Last year I successfully wrote and posted a poem-a-day. The mission of the zine will be to share: poetry on the genealogy obsession (the research, the rewards, the pitfalls), as well as biographical poems about ancestors and kin. We will include poetry by famous authors (such as Robert Frost, who inspired the title of the zine with his poem, Generations of Men). We will also be open for submissions from poets interested in genealogy, and genealogists with a hankering for poetry. In its opening month, I hope to post a new poem each day. The frequency of poetry after that will be completely dependent upon submissions. The less I have to write in April, the happier I will be. Ideally, none of these poems will have been written by me. Ideally, all of them will be selected from submissions. Interested poets should read the guidelines for submission. This week I transcribe two letters from my great grandfather, Melvin E Van Every, to his daughter, and my grandmother, Myrtle. They wrote to each other weekly, and I have many of his letters from 1926 and 1927, but none of the letters she wrote. Of course, he refers often to what she wrote, so there are glimpses. This week I transcribe a newspaper article from the El Paso Herald, which I found at ChroniclingAmerica. The article mentions my great grandfather, Melvin E. Van Every. St. Louis City's Central Library (with most of their genealogy collection) closed in the middle of 2010 for construction. They won't open again until some time in 2012. What I didn't see coming is a Genealogy-Specific site for the City library system. 1 Block from where I work. We will be opening our new genealogy and local history branch on Monday, 14 March 2011. Hours of operation: M-F: 9 am-5 pm; First Saturday of each month, 9 am-5 pm. Parking: Free on-site parking for users of Compton Library. In January of 2008 Charter Communications accidentally deleted thousands of email accounts. In December of 2006 Google accidentally had deleted 60 gmail accounts. Here's a January 2008 post of mine explaining how to backup gmail with Pop3. Recently a Google glitch disabled 150,000 gmail accounts. Mashable posted a backup method using some software called Gmail Backup. To protect your information from these unusual bugs, we also back it up to tape. Since the tapes are offline, they’re protected from such software bugs. But restoring data from them also takes longer than transferring your requests to another data center, which is why it’s taken us hours to get the email back instead of milliseconds. Google's offline tape backup is very reassuring to this customer. I am not one of the .02% of Gmail customers who woke up a couple days ago to empty accounts. You would have heard from me if I had been. While it may be possible to imagine a natural disaster that might impact both the backup servers and the tape backup simultaneously, I am comforted that they are not relying completely on digital storage.